( March 21, 2014, Oslo, Sri Lanka Guardian) As the 25th session of UNHRC is unfolding in Genève, we are told that the supposed international community’s attention is directed towards the island of Sri Lanka. It was thus expected that the Sri Lankan state would be restricted in its conduct concerning human rights violation and Tamils. Furthermore the US sponsored draft resolution leaked on 3rd of March and was condemned by Tamil organizations around the world for being vague, toothless and in the continued facilitation of Sri Lanka’s domestic mechanisms of investigation. However for the Sri Lankan state and its officials, the possibility of US sponsored international scrutiny and pressure was visibly building up fears of punitive actions. In that vein, the Sri Lankan state was looking for means to silence witnesses and other evidence of the allegations it is confronted with. As the 25thsession of UNHRC is unfolding in Genève, we are told that the supposed international community’s attention is directed towards the island of Sri Lanka.It was thus expected that the Sri Lankan state would be restricted in its conduct concerning human rights violation and Tamils. Furthermore the US sponsored draft resolution leaked on 3rd of March and was condemned by Tamil organizations around the world for being vague, toothless and in the continued facilitation of Sri Lanka’s domestic mechanisms of investigation. However for the Sri Lankan state and its officials, the possibility of US sponsored international scrutiny and pressure was visibly building up fears of punitive actions.In that vein, the Sri Lankan state was looking for means to silence witnesses and other evidence of the allegations it is confronted with. The former high commander of the Sri Lankan state propaganda, Dr.Jayantilleka expressed in a recent article on a Sri Lankan website that panic is building in Sri Lanka and that it is to be foremost blamed on the inadequate diplomatic cumin and the delusional mindset of Sri Lankan officials. It is to be noted that he is by no means acknowledging the credible allegations against Sri Lanka as he is renowned as an articulator of the state’s denial of genocide and national oppression. Despite the UNHRC session, the demonstrations against Sri Lanka by Tamil and HR organizations and the panic within Sri Lanka of a possible foreign intervention, the Sri Lankan state has once moredisplayed its pathological condition and fundamental characteristics. On the 13th of March over 500 Sri Lankan security personnel entered the village of Tarmapuram in Killinochi district in the Tamil north of the island. The entire area was placed under military lockdown, reminiscent of the counter-insurgency war, subsequentlyterrorizing the locals who had earlier been part of various street demonstrations against enforced disappearances (1). The intent of the military operation became evident as they singled out and surrounded the house of Balendran Jayakumari. Since the end of the war she had become a prominent activist on behalf of families of disappeared people in the North and East. She has ever since been part of various street demonstrations in the Tamil regions to demand the whereabouts of the tens of thousands of disappeared (2). During the much circulated visit of British PM David Cameron to Jaffna last November, Mrs. Jayakumari and her 13 year old daughter Vipooshika participated in street demonstrations against enforced disappearances and unlawful detentions of thousands of Tamils. The pictures and videos of a crying Vipooshika demanding the return of her brother became the epitome for the plight of the families of disappeared people and gained widespread media coverage.The brother, 15 year old Balendran Mahintan was forcefully recruited by the rebels during the final stages of the war. Subsequently he was handed over to the army by his mother during the immediate aftermath of the war. A photograph of him in army custody appeared in one the Governments LRRC publications,nevertheless there has been no traces of him ever since. There have also been frequent reports of harassment, sexual violence, unlawful detention as well as enforced disappearances of Tamils, in particular former rebels, which indicate the coordinated modus operandi of these crimes. Moreover Mrs.Jeyakumari is widowed having lost her husband and two more sons in the war. Despite this she has displayed remarkable fortitude in waiting for her disappeared son whilst also fighting for her people who have sufferedsimilarly under the military occupation of their homeland. Due to her resilience in fighting against injustice, and also being a witness which could implicate the state in crimes against humanity, she has been singled out to be silenced. 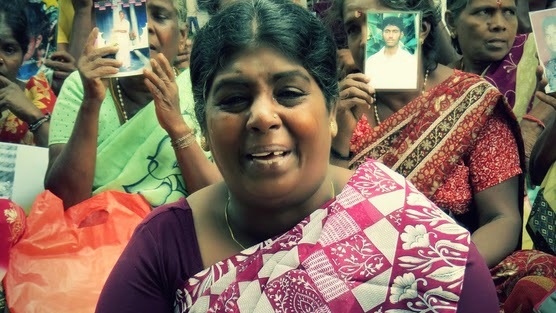 Sources have told the JDS that Mrs. Jeyakumari was taken by the Terrorist Investigation Department (TID) to Killinochi before being shifted to Boosa camp in Colombo, which is notorious among Tamils for torture and extra judicial killings. Her daughter, the courageous Vipooshika is reported to be currently held in a juvenile correction centre. The heavy military deployment in the Killinochi region following Mrs. Jeyakumari’s arrest has effectively sent waves of terror and fear among the locals.On 17th March there were reports of additional troops being deployed ensuring heavy military control over the Killinochi and Vanni region. Moreover information obtained by the JDS illuminated that the Sri Lankan state have also unlawfully detained two more Tamil women from the North and East (3). On 11th March, Balaguruparan Tharmila,a 26 year old pregnant mother of a four year old son from Uppu’veli in Trincomalee district was arrested by Sri Lankan intelligence officers and is now reported to be held in an unknown location in Colombo. Earlier her husband had been unlawfully arrested by the Sri Lankan authorities and has since gone missing. Her arrest follows a complaint filed by her regarding the whereabouts of her missing husband and recent reports elucidate that the military attacked both Tharmila and her child during the arrest (4). On 12th of March, Nitharsana, a 28 year old Tamil woman from Visvamadu in the northern Mullethivu district was arrested alongsideher mother and brother. Two days later the mother and brother were released whereas Nitharsana was still under the detention of the TID. This form ofunlawful detention and military repression is part of a coordinated terror campaign unleashed by Colombo as a move to further brutalize the Tamil people and disintegrate the resilience of the spirit of resistance among them. To the contrary several human rights activists, civil society members and politicians assembled in the Tamil town of Vauvuniya under a protest called by the Tamil National Peoples’ Front (TNPF) to demand the immediate release of Mrs.Jeyakumari and Vipooshika(5). Similarly some human rights activists from the Sinhala south have also participated in the campaign to secure their release. In this regard, renowned human rights activist Ruki Fernando accompanied Reverend Praveen in travelling to Killinochi to partake in the efforts. The former is a human rights advisor to INFORM, a human rights center based in Colombo, and the latter is a Tamil Christian priest and also the director for Centre for Peace and Reconciliation (CPR) based in Jaffna. However on the 16th of March upon arriving in Killinochi they were subjected to the fate of those they campaigned for as the TID unlawfully arrested them both, and subjected them to vigorous interrogations (6). Recently the police spokesman SSP Ajith Rohona stated that the two had been charged with attempts to create “ethnic discord among communities and promote separatism”. The state practice of legitimizing unlawful detention under charges of creating ethnic disharmony and advocating secessionis institutionalized in Sri Lanka. Due to sustained pressure from Human rights activist and organizations within the island and around the world, the Sri Lankan state were compelled to release Ruki Fernando and Rev. Praveen on the 19th of March, nevertheless they legitimized their detention of the activists. It has also been reported that all the arrested were being held under the draconian Prevention of Terrorism Act (PTA), under which anyone under the suspicion of unlawful activities are subject to arrest and can be held until 18 months incommunicado without trial. It has since its passing in 1979 been systematically used in particular to persecute Tamils. It ensured in effect the legalization of unlawful detention and disappearances of Tamils and dissidents which was characteristic throughout the civil war. Moreover regarding Mrs.Jeyakumari’s arrest, the Sri Lankan state and state centered media are preoccupied with propagating a fabricated story where she is narrated as being an accomplice of a former LTTE cadre who shot and injured a police officer the same day of her arrest. Once more the authorities are using the hoax of LTTE regrouping to create a pretext for implementing and legitimizing oppressive measures against Tamils (7). Despite such brazen violations of human rights, and the continuation of counter insurgency measures to persecute Tamils and dissidents, the international community still bestows upon the Sri Lankan government the legitimacy to independently address the credible allegations against it. The continued and coordinated repression leased upon Tamil women depicts a merciless and ruthless Sinhala chauvinist state which further brutalizes the battered Tamil women who have already suffered immensely due to the war. Ignoring the nature of the violence perpetuated, the UN is acknowledging Sri Lanka as a legitimate partner in deciding the future and in delivering justice for Tamils. When the current UNHRCsession and the subsequent international scrutiny on the Sri Lankan state is not adequate to circumscribe its oppressive actions, then how can such a criminal state be claimed to have the capacity to address let alone deliver justice for the crimes and grievances the Tamils have been subjected to? On the basis of what logic is the perpetrator state asked to deliver justice to a people it has subjected to national oppression and genocide? The matter of the fact is that the defiance of the Sri Lankan state is ensured by the feeble approach taken by the UN and the international community. Since the war’s end in May 2009 several processes at the UNHRC have effectively reiterated the legitimacy of the Sri Lankan state and facilitated it with more time to ‘reconcile’. Such a stand has emboldened the Sri Lankan state to blatantly manifest state actions as it befits them without any concern of consequences. The reconciliation effort applauded by the US as progress in the draft resolution is mere camouflage of the unfettered oppression perpetuated on the island. While a genocidal regime is enforced in the militarily occupied Tamil homeland to the north and east of the island, the government has consolidated an anti-people and a dictatorial regime in the Sinhala south. The latter was evident in the recent violent state crackdown on peoples protests in the south against industrial and multinational exploitation, such as recently in Hanwella in Borella district and last year in Weriweriya (8). The increased violence used by the state in quelling peoples’ struggles in the south seems to have directed the victimized Sinhala people towards a realization ofthe nature of the state actions in the Tamil north whereas the UNHRC still gives Colombo the benefit of doubt and glosses over national oppression.